Jaw Dropping Views of the Lake View from Lake View from the lake Steps to the Deck View from the lake Front Porch with Ping Pong Dining Porch. Main Level. Bedroom 1. Upper Level. King Sitting Area. Upper Level. Porch 1. Side View Front View View from the lake View from the lake View from the lake Deck area Living Room Living Room Kitchen and Dining Area Dining Area Washer and Dryer Bedroom 3. Upper Level. Full Bed. Bedroom 2. Upper Level. Queen. Bedroom 4. Upper Level. Bunk Bed. Bathroom 1. Main Floor. Shower. Living Room Outdoor Shower Bedroom 1. Main Level. Full. Bedroom 1. Main Level. Full. Bedroom 2. Main Level. 2 Twin. Bathroom 4. Upper level. Shower. Bathroom 3. Upper Level. Master Bath with Shower. Bedroom 2. Upper Level. Queen. Bedroom 2. Upper Level. Twin and Crib. Porch 1. Upper Level. Queen and 2 Twin. Porch 2. Upper Level. 3 Twin Beds. 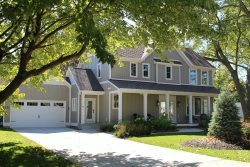 Nestled along the Lake Michigan shore with awesome views, Master Lodge boasts a large dining porch and loads of space for everyone! This rustic cottage will be the place your family will want to come back to year after year. One of the perfectly situated cottages in Palisades Park, on the lake and close to everything they offer. Just 4 miles south of downtown South Haven, you aren't far from all the dining and shopping if you like. Two association beaches, trails, and hiking. There is no beach in front of the lodge. Ten tennis courts, 6 of which are clay. Basketball court, baseball field, children's clubhouse for day camp and a Soda Bar for burgers and ice cream cones! You may remember places like this from your childhood. Perfect for retreats, conferences, large group getaways, girls weekends and football reunions. WiFi is for email and browsing. Excessive data charges for streaming, gaming etc may be charged. WIFI at the house for email and browsing. Also at the Soda Bar. Excellent and responsive team at Shores Rentals! Very nice and we will be back, a very convenient place for all to travel to. Working with your team has been a positive experience and they have managed to fulfill my wishes positively. I look forward to a very special 2019 thanks to their efforts. As wonderful as always. We have a constant slide show of previous years spent there going on during our stay. The memories we have are priceless. As an example there are pictures of Caitie and the cousins as toddlers splashing in a blowup pool on the deck as toddlers and now we will be adding pictures of her and David on the deck celebrating their engagement. What a treasure! We loved the Master Lodge. It perfectly accommodated our family of 17 with rooms/beds to spare. The highlight of our stay was sitting on the deck or the adjacent beach enjoying the view of the lake. Appreciated Dawns empathy and customer service with our concerns. She was attentive with our calls. The Plummer was friendly when he came and told us adults should not use the toilet. Exterminator came but didn't return to address issue. We had a wonderful vacation however with the amount we paid we expected the house to be in better standing. We do appreciate the offer to refund a small amount of rental fee. It was a pleasant, painless experience and there were no bumps in the road. One of the grandchildren summed it up when he said, "Nana, this is my favorite place on earth." The staff was great. All were very helpful! Two comments by two grandchildren say it all. A sixteen-year-old grandson said, "Nana, no matter how old I get, I'll always want to come to South Haven." And as they turned into the entrance of Palisades, a twenty-one-year-old granddaughter said, "My favorite place on earth!" They've been coming to South Haven every year of their lives. And we plan to continue.